When you’ve reached a position in your lives when your mode of travel is all about the two of you, then the Navian N512 may well be the conveyance you seek. 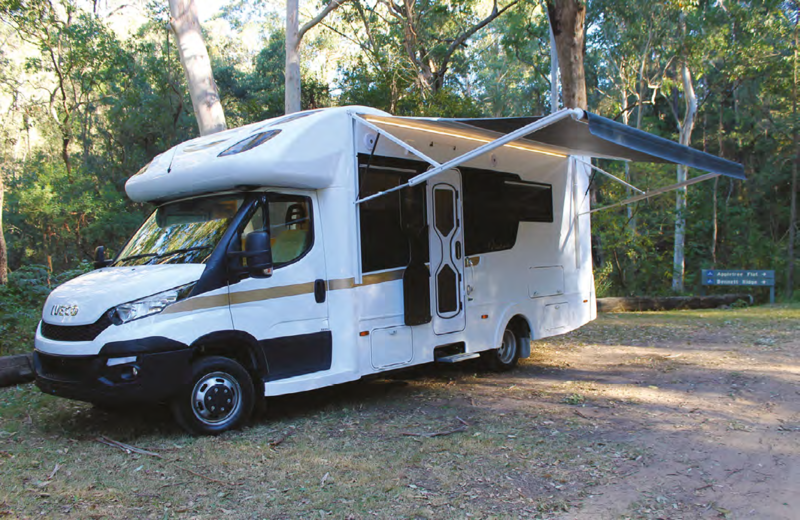 A new top-line element in Sunliner’s range, the Navian B class series’ offers much in the way of standard equipment and therefore little head scratching about your possible options. Even the leather upholstery is a no-cost option, so there’s little to bargain with yourselves over – you either like leather or you don’t. And as this model is a two-person proposition in terms of passengers and berths there’s no grand-kid consideration to be taken into account with the furnishings. 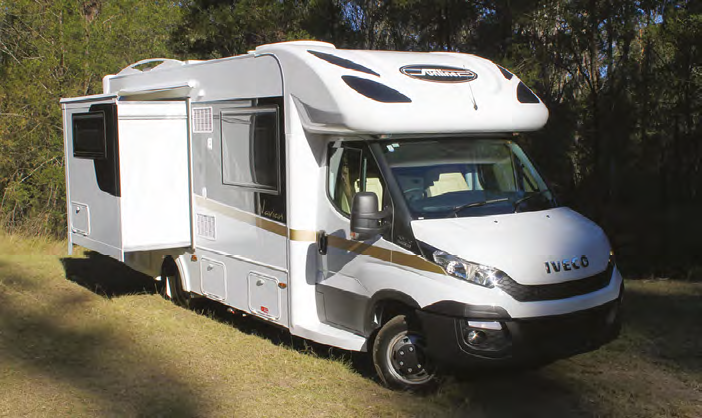 So, while there are layouts in the range that incorporate slide-outs and bed options, the Navian N512 is just about the two of you. 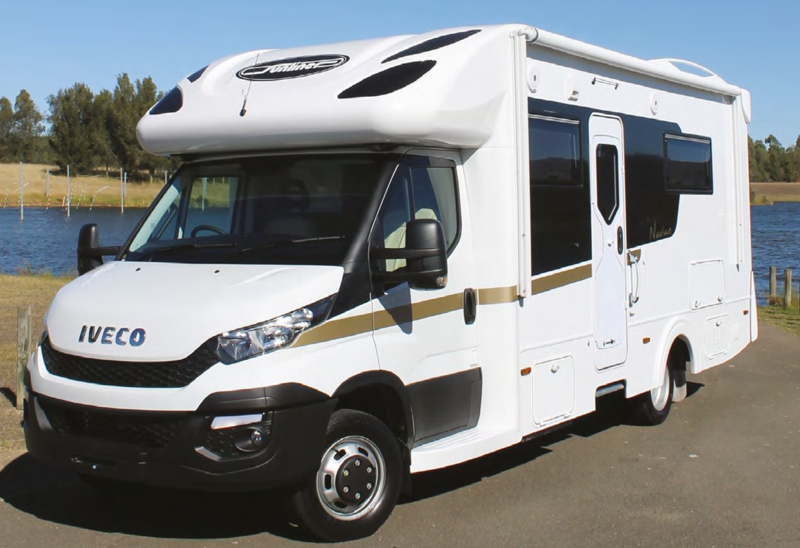 To underpin this new fleet Sunliner offers a choice of Fiat Ducato, Mercedes- Benz Sprinter base vehicles or, as in this test vehicle, the Iveco Daily. Two Iveco chassis are available offering a driver on a car licence the 50C17 with a GVM of 4495kg and LR licence holders the 70C17 chassis rated to 7000kg, or like the Navian 512 here, a 50C17 rated at 5200kg. There are two Iveco diesel engines available in single and twin turbo versions. The latter ups power to 170kW over the 125kW in this version, although torque drops to 400 from the 430Nm we had on tap that was wonderfully exploited by the fantastic eight-speed fully automatic gearbox. This gearbox is simply seamless, to coin the cliché; no harshness nor indecision so that the motor is on song at all times. The cabin, swathed in black here, is stylish, with its swooping centre console, and the old safety issue of having to let off the handbrake to have the driver’s seat swivelled has been addressed by the addition of a Park button (auto release) on the gearshift and the ability to raise the driver’s seat to spin and clear the handbrake lever on the floor. 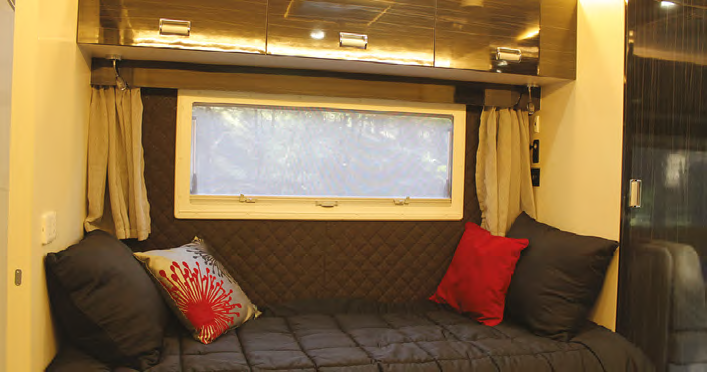 The black cabin is highlighted by the cream-white leather that introduces the bright and modern-looking design of the motorhome quarters. LED ‘aircraft’ strip lighting features everywhere, with the addition of blue-tone mood hues in the chrome reading light fixtures it’s easy to set the house aglow to make it as cool or cosy as you prefer. If entering through the side door you’ll do so via the electric step and you can extend the standard electric awning too, if you’re planning to sit outside. The Dometic door features integral security wire mesh as screen door while a separate outer panel allows the airflow or seals the complete door unit. The kitchen dining area is to the left as you enter where a table mounted on an adjustable boom arm has to perform double duty as preparation area and dining surface because there is minimal food prep space in the kitchen. Once the gas stovetop is in use there’s just the sink and drainer to the right, so you’d have to use the dining table for any other cooking prep making setting it for a meal a last minute task. With a standard external gas outlet then cooking outdoors is an option. The sink has three drawers beneath and there’s a pot drawer under the oven. Overhead lockers furnish both sides of the dining area. One of these contains the screens and switches for the power and water monitors although the Navian is now looked after by the Finscan System that offers a customisable nerve centre for the vehicle systems in terms of lighting, power, water and diesel heating, etc. The Navian has two 100 amp-hour batteries as standard and a 1000W inverter plus two 140W solar panels. The Finscan monitor lives above the entry door and can even be separately controlled by an app. The Dometic aircon unit is in a roof panel here with four down lights. The (in this case) leather dinette lounge features storage underneath and a drawer that opens out towards the entry door. One of the striking features about the Navian’s interior are the gloss finishes to the cupboards and the fridge and wardrobe doors that are opposite each other and divide the living and bedroom areas. Along with the laminates for the lower sections of storage it’s part of one of several decorative themes – with curtains and fabrics if you omit the leather – you can choose for your vehicle. The full-length hanging space is an often missing unit and for internal storage in the bedroom area it’s augmented by three overheads on the near side and an underbed cupboard on the offside that is also accessible from outside. 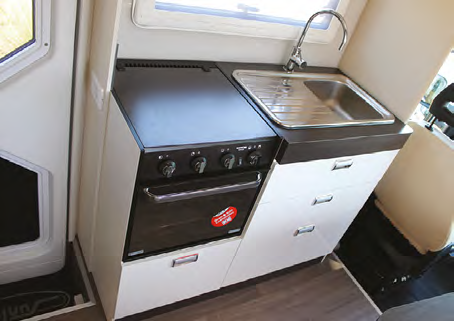 The offside bed is within the slide-out unit that because it’s a single in the N512 means that when retracted there’s access to the rear side-to-side bathroom, with itself comes with a standard wall-mounted washing machine. The toilet area is well served with shelves, and a nice basin layout plus a window and great strip lighting. 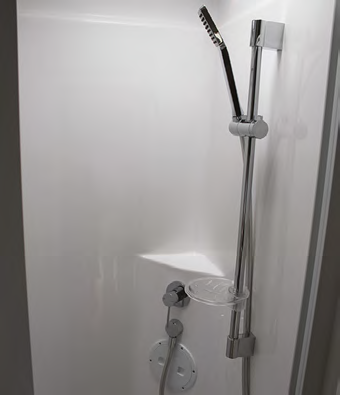 The shower cubicle is equipped with domestic quality chrome fittings and a powered roof vent while the whole area can be screened off with a concertina retractable door, albeit with a fiddly press stud clip. The only issue when visiting the bathroom is you would have to mind your head when returning to the offside bed/couch as the slide-out module has a low roof line that doesn’t match the full-height ceiling on the opposite side. 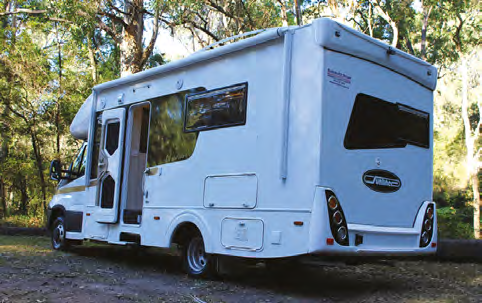 Both bed units have plenty of 240V/12V/USB outlets available and a second TV can be mounted above the near-side bed. We questioned the apparent oversight here in that there’s no provision for bedside storage to place or rest anything for either side of the vehicle in this bed set-up. Sunliner told us that this is organised at purchase time, where the customer specifies the placement of a glass shelf in a position that suits them. Moving around the outside of the Navian, the nearside has a bin forward of the entry door, and then a bin for the batteries and Projecta charging system and Nucleus unit linked to Finscan. The rear view is covered by the standard reverse camera. 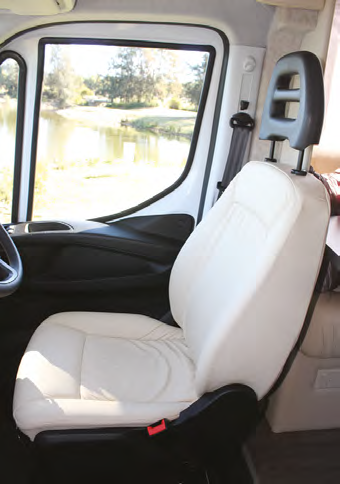 The Iveco-borne Navians benefit from a satnav system that’s built in whereas Fiat and M-B units use the rearview mirror to display the camera vision. Past the hatch for the toilet cassette access on the offside there’s another bin that you will have to remember to open the slide-out to open. The slide-out itself has a roll-out blind above to prevent tree debris, etc. being dragged into the mechanisms and keeps the worst of the weather off. As mentioned the slide-out hatch reaches through to the inside and this hatch is also lit with LEDs. Twin bins with one for the twin 9kg gas bottles round out the external storage. Sunliner has thrown a lot at the Navian, and while it’s at a price point to match, there is lot of standard equipment leaving you very little, if nothing, to spend. Choosing a Navian with a slide-out double bed from the rear or side would make a huge change to the layout, but for those requiring two singles this N512 option also provides more interior space. The other main choice is motive power and that may sway you with what you’ve owned before. However, if that doesn’t extend to an Iveco with this eightspeed auto do not dismiss this version, that would be to do yourselves a huge disservice.